Lock in a great price for Agroturismo Atzaró – rated 8.9 by recent guests! Ah I just loved this place <3 We stayed with my bridesmaids for bachelorette party at Atzaro out of season. I don't know where to start... the rooms were just amazing, like for princesses :) the food was just unearthly. I loved cafe bombon :) and they have their own cointreau made out of clementines <3 delight!! The staff was super helpful and positive. We went to a free yoga class, but I think by mistake we joined one of there retreats haha, as instead of yoga and meditation we had hard workout... we couldn't walk the next day of cramps haha xD We also enjoyed the free sauna, all the facilities were just amazing! We also had photographer take pictures of us at Atzaro... It was just dream come true! The whole place is just so peaceful, in the middle of orange trees, with birds chirping. I recommend it to everyone :) enjoy! It’s beautiful and tranquil. A little piece of paradise. Great hotel, relaxing and eco-centric. The natural ponds and environment are beautiful, off season it's also excellent value. Stunning property with beautiful gardens, so much space to lounge and while away the days. Breakfast was fantastic in the garden everyday. Live music every night and the yoga and spa is top notch. Amazing setting, we went for my brother's wedding which was simply beautiful. The food is lovely and it is a great place to relax. The bedroom was rustic in style but extremely comfortable. Loved my room and my outside space with outside 2nd bath and shower. The peace, chilled ambience, friendly staff and good food especially macrobiotic salad! Spa massage with Maria was fantastic. This place is heaven on earth. If you want to escape for a few days this is the perfect place to do it. Because there are not many rooms the hotel never feels crowded. Although it is remote it is still well located for some fantastic beaches and Santa Eulalia. The breakfast was also amazing. Will be back! 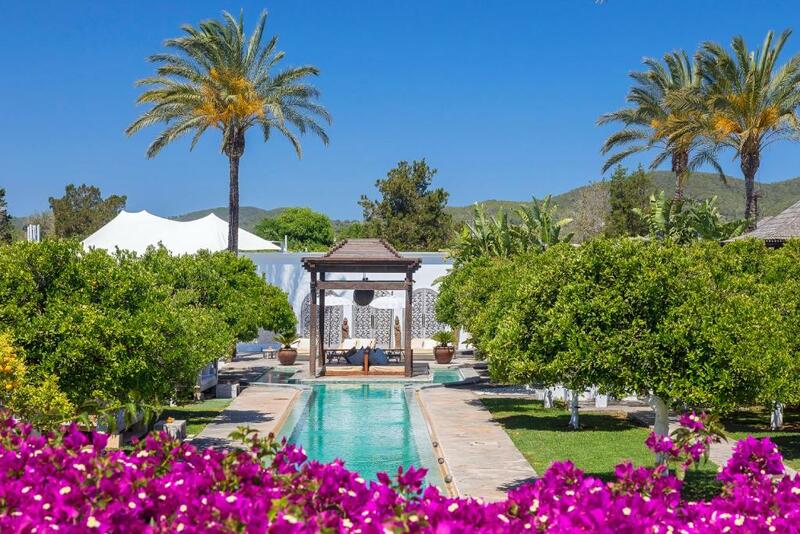 Set on an orange grove in the Ibizan countryside, this beautiful rural hotel features a small outdoor swimming pool and small spa. It offers free buffet breakfast. Agroturismo Atzaró’s rooms are individually styled. Some have a private terrace with a fireplace, and all include a flat-screen satellite TV, a mini bar and a tea/coffee maker. The private bathroom includes a bathrobe and slippers, as well free toiletries and a hairdryer. The spa features a chill-out area, a traditional Maroccan hammam and a sauna. Guests can also enjoy massage and beauty treatments, and there is a small area where you can practice yoga. Atzaró’s gourmet restaurant serves creative Mediterranean cuisine, while La Veranda restaurant offers fusion cuisine. There is also a bar by the pool and in the spa. The beaches are just 10 minutes’ drive away, and Ibiza and Sant Antoni Portmany can be reached in 20-30 minutes by car. When would you like to stay at Agroturismo Atzaró? These air-conditioned double rooms feature a romantic décor with elegant furniture and an extra large double four-poster bed and a sofa bed. Some rooms have a private terrace with an Ibiza-style fireplace. In-room amenities include free Wi-Fi, a flat-screen satellite TV and an iPod dock. These air-conditioned suites feature a tranquil zen décor. There is a small seating area with a sofa bed and some rooms have a private terrace with an Ibiza-style fireplace. In-room amenities include free Wi-Fi, a flat-screen satellite TV and an iPod dock. These air-conditioned suites are larger than the standard suites and have a larger terrace. In-room amenities include free Wi-Fi, a flat-screen satellite TV and an iPod dock. House Rules Agroturismo Atzaró takes special requests – add in the next step! Agroturismo Atzaró accepts these cards and reserves the right to temporarily hold an amount prior to arrival. Luxurious, comfortable, cant wait to come back. Dinner menu needs more variation and some of the dishes weren’t exactly how described. Eggs at breakfast were undercooked on one occasion. I appreciate the main pool is out of use in winter but they could still put some sun bed cushions out as the weather was good enough. Service is slow. It took nearly an hour to get a pina colada to my room. Sound proofing could be improved. A great haven of peace! Wonderful garden with beautiful trees, fabulously comfortable bed, lovely staff. Qualitative food. Lap pool is definitely a great asset. We had the most beautiful room and the whole stay was just amazing. Spa and pool areas are idilic and relaxing. Food is excellent! Staff are friendly and helpful. One of my favorite places to stay on the island. Busy place with a lot of 3rd party events. Suites on other side of street nice and comfy but very noisy (especially with heavy oak furniture moved on a stone floor above your head). Limited menu. All a bit run down. Would never again spend nearly €700 a day there. Wasn't a problem but worth being aware the bathrooms in many of the rooms aren't particularly private - around a corner from the sleeping area separated by a wall but not a door. At the spa my other treatments were by someone who kept their jacket on both days. For me definately not professional and actually makes you think they don’t want to be there. Not relaxing.